Things I have found to be different in Japan compared to Canada with pregnancy. Once you know your due date you need to go to the City office to register. You will receive a mothers book you must take with all your appointments, and you will receive a coupon book for your appointments. Here in Japan food restrictions are not as bad. You are allowed to eat sushi, but limit it to once a week, and only recently have the Japanese government been setting guidelines for the amount of high mercury fish that is allowed. Raw eggs, deli meats and cheese is not problem. Most Japanese doctors don't even give any advice on their diet, although you can find all this information in magazines and pamphlets you receive free during your pregnancy or buy at bookstores. Most likely you will find information on the right diet you should have, and how many calories and the types of food you should be eating. Because gaining too much weight in Japan is a strict no. Also in Japan there is no information for taking prenatal multivitamins or folic acid while pregnant. Only lately have magazines put information on these details, and usually don't start until closer to the middle of their pregnancy if it is needed, most magazines tell you the type of food you should eat to get all the vitamins and folic acid you need. The weight gain is different, they are very strict at you and doctors will be angry at you if you gain more than the max amount of 9 kilo/20lbs compared to how much would should gain in Canada 11-16kilo (25-35 pounds). My doctor is a bit older and very busy so he hasn't been too strict with weight, and has yet to take my weight, which is a big relief for me, as I have heard some horror stories from other ladies about their doctor and nurses yelling at them for gaining too much weight. The Japanese believe the less you gain, the less the baby will weight and with a small baby, the birth will be easier and cause less complications. Which leads me to say, epidurals and painkillers are very rare thing in Japan, and doctors believe that it leads to more complications than having a natural birth. My doctor has the required degree for epidurals, but refuses to use it, and also mentioned that other doctor may offer it, but do not have the correct degree to administrate it and this cause a lot more complications during your birth. If you are looking to have one, you will have to find a special hospital that will offer it and usually cost a lot more money. There is no official rule here in Japan for working during your pregnancy, but it's typical in Japan for you to quit your job by the time you start your second trimester, it is very rare to see someone working throughout their entire pregnancy.Even now with me, I have had a hard time with my company while continuing to work. Every time I a go to the office I have at least one or two people asking me ''Are you ok? '', or "I can't believe you are still working", or "Why haven't you left yet?". Even with my private lesson students, I always have them asking me at the beginning of each lesson to be careful, and others saying how I shouldn't be climbing stairs. Yes that stair climbing one I have got plenty of times. How I shouldn't take the stairs, it's dangerous. I've only heard this once before, but assumed it was just an old-fashioned rule, but no bicycles. It's a big no. Pregnancy resources and magazines all recommend not riding bicycles while pregnant and is frowned upon. But once the baby is born, you can use your bicycle, no problem. There has been so many times where I have seen bicycles with children seats, often at times there are two children seats, a baby in the front, and toddler in the back, and both with no helmet, this no one even stops to stare...but bicycling while pregnant is a big no. Here you see a pregnant lady on a bike, and a caption saying "Dangerous". Back in Canada, there are of course the few sports you aren't allowed to do, contact sports, extreme sports etc...but here in Japan the most acceptable exercise you are allowed to do these days, is just walking,. that has only been allowed lately, in the past even walking for long periods of time has been a big no. Most gyms here in Japan don't allow pregnant ladies, or you must go to specialized lessons if you are pregnant. These lessons are usually very rare, and double to normal price you would find at the gym. I would love to try maternity yoga, or maternity Pilate classes, but I have to say my wallet just won't allow it. Also heavy items, I have had my mother-in-law mention many times how I shouldn't be lifting heavy items, and I shouldn't be lifting my arms above my head, yet another old wives'tale. 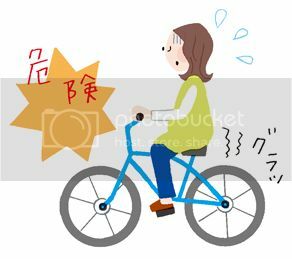 But when I tell any Japanese people I am keeping a workout routine, I always get shock and concern how I should do anything like that, and just relax. Though I have had heard nothing as such from my doctor, who usually never says anything. So as long as I feel comfortable with my exercises, take my time, and drink plenty of water, I will continue to exercise throughout my pregnancy. Of course I hope to use both countries ideals and choose the best for my own pregnancy. As my pregnancy continues on, I hope to add more and more to the list. Also if there is any other information from others that have heard or experienced, I would love to hear your stories as well. Really interesting this one Linz! Thanks for sharing :) You can definitely see some differences there. I've had a number of friends having babies lately and actually there is a lot more encouragement I think to exercise as much as is safe during pregnancy. Some women can go for quite a long time, just depends on the position of the baby. For instance my cousin was big on working out but had to stop in the middle of her pregnancy because the baby started resting on some nerves in her legs.